Devastated by the country’s civil war, a Serbian couple is haunted by evil. In his debut novel, Patric (Las Vegas for Vegans, 2012, etc. ), who immigrated to Australia from Serbia as a child, offers the dark, surreal tale of Jovan and Suzana, immigrants in Melbourne beset by memories of their past. Forced out of their homes, fired from their jobs as university professors, tormented and tortured, they ended up with their two children in a refugee camp. On the first day, all except Suzana ate a dinner that turned out to be poisoned: the children, ages 4 and 6, died; Jovan writhed in pain for two weeks but survived. The children’s deaths were an unspeakable loss “of God and the skies, it is the loss,” Jovan reflects, “of the past and the future.” Overwhelmed by grief, the couple “found a way to live without response,” which makes them, as fictional characters, unusually passive. In their adopted country, Jovan takes a job as a hospital janitor; he cleans the bloody remains of medical procedures and miscarriages and also the weird graffiti that appears with maddening frequency on all surfaces: “Dog eat dog eat dog,” “Winner rapes all,” “Masters of Destiny/Victims of Fate,” “Ethical Cleansing.” Jovan calls the mysterious writer Dr Graffito and comes to feel that he, personally, is being targeted, even when words are slashed into a woman’s corpse; even after an ophthalmologist commits suicide when messages appear on her eye chart; even after a woman is murdered. Echoes of the television series The Bridge come to mind, but Dr Graffito, malevolent as he is, does not seem to be politically motivated. Instead, he appears to represent sheer, demonic evil. 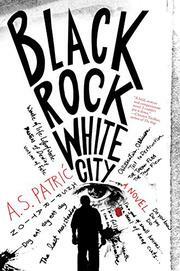 Patric’s poetic language is highlighted by occasional passages from Jovan’s poetry, though these slow down the novel’s deliberate pace. The surreal, dreamlike atmosphere is intensified by Jovan’s unbelievable affair with a sexually voracious dentist, his confrontation with a drug-addicted nurse who accuses him of being Dr Graffito, and Suzana’s stark memories of a sadistic professor. A grim, unsettling tale of wounded characters.